January 2014 - What a Fantastic Christmas! 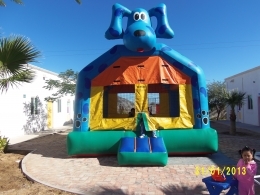 In Mexico there is a Holiday early in January called "Three Kings Day". The tradition has to do with the Wise Men bringing gifts to the Baby Jesus. Like Christmas, family and friends gather together to celebrate the day. One key tradition is the Rosca de Reyes, a sweet bread baked in the form of a crown. There is a small doll baked inside the bread to remember how Jesus had to be hidden from King Herod and his army. It is fun for the children to find the baby Jesus in their piece of pastry. So this year the local Police Department contacted us and asked if they could come and celebrate "Three Kings Day" with the children. I was surprised to see practically the entire police department (in uniform) arrive with piñata's, gifts (2 per child) and cakes to share with everyone. The Chief of Police told Gary that only a small crew of officers were on duty to cover the community…the rest were with us to celebrate and get to know the children. Before the officers arrived, I spoke with the children about the pending visit. You see, many of our children have unpleasant memories of Policeman. Many were removed from their homes or taken from their mothers by Police Officers. Their memories are connected with terror, trauma & fear when the police arrived and took their parents away. After talking to the children, they all seemed to be more comfortable about having the Police Officers visit them in Sonshine. They were really happy to learn that their "Papa Gary" had been a Policeman for many years and they all know that he is one of the good guys!! The afternoon with the officers was filled with laughter and joy. I was glad to see that our city has such fine law enforcement officers. They plan to continue to keep in touch with the children and for that I am thankful. They have also begun to do something new for us at Sonshine. At different times of the day, the officers drive by Sonshine and ring our door bell. It is like a welfare check…just to make sure that we are O.K.. We bring a folder for them to sign their name, date and time of their visit at Sonshine. I like to think that something or someone?? touched the hearts of these men and women. The Lord works in wondrous ways!! God is so faithful to provide for all our needs!! That was made so evident to all of us recently at Sonshine Hacienda. We have two Airporter type buses. If we continue to grow at the same rate as recently, we will need both buses to transport our kids to school, church, etc.. There is maintenance required to maintain these vehicles, and it is costly. But thanks be to God, we have a wonderful church in Parker, Colorado…Crossroads Community Church, that seems to know what our needs are even before we do!! We received a call from the church a while back that illustrates their commitment to serve. They asked us if we were to receive a certain dollar amount of money, what would we use the money for? I took a quick poll of our Staff and we all agreed that the amount would cover 7 new tires for our biggest bus. So I called them back, gave them our answer. A few weeks later we received a check in the mail for our 7 new bus tires. 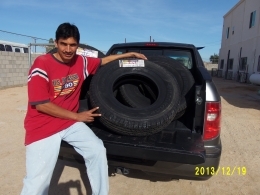 Pictured below is Alvaro, our Administrator with our new tires for our Sonshine bus. Praise the Lord!! Please pray for our three boys who need to take medication to control their hyperactivity, oppositional disorder and other serious emotional problems. Specifically pray for the Doctor, Roberta, their Dorm Mom and the teachers who deal with them in school. Most of all pray for patience for all of us. Pray for our precious Dorm Mom's. They are Saint's!! God has blessed us with wonderful servants to serve these children. We are all blessed because they are here. Pray for our three children who attend a "special needs" school. They struggle in their studies, but the teachers in this school are very dedicated and we have one of our kids ready to be mainstreamed into regular school…pray for Carlos. Pray for patience with our school system here in Las Minitas (the local elementary and Kinder schools close to Sonshine). We are frustrated due to constant canceling of school without valid reasons (at least in our opinion). 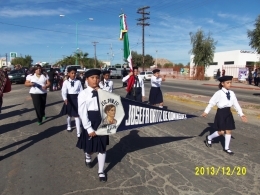 While other schools in San Felipe are in session, our children are at home. 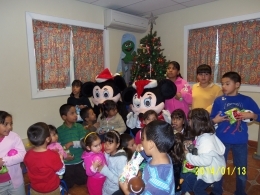 During December & January we received many visitors to visit with the children. Pictured below is Mickey & Minnie Mouse visiting with the children. They also brought Santa with them and gifts for all the children. The children loved the visit. WHAT A FANTASTIC CHRISTMAS !! Fantastic is a great word to describe Christmas this past December, but a better word is BLESSED!! To be honest, it is quite a challenge to make a memorable Christmas for 25 children and six staff members…but with all of your generous help and the help of our Lord and Savior, we had a wonderful Christmas season. 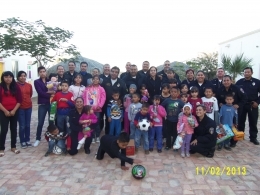 I am constantly amazed at the out pouring of love that our small community of San Felipe shares with our children. We had a local high school class come and treat the kids to a fun day of Pinatas, face painting and even a great lunch that they had prepared. 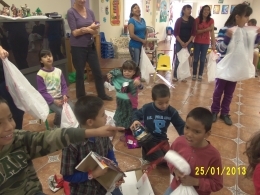 Every child received Christmas gifts as well. We had other people just stop by and drop off gifts for the children. One of these groups was a club of bicyclists. They just stopped by with two gifts for every child. We also had Mickey and Minney Mouse stop by (in full costume) with gifts and goodies to eat. 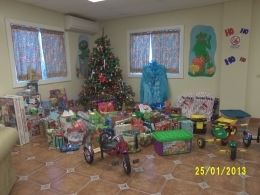 Then there were all of you (who are reading this newsletter) that sent wonderful gifts through the mail and monetary donations to help us buy gifts for the kids. What a blessing all of you were to Gary, myself, Diana & Alvaro. We cannot say thank you enough. Christmas morning was great. It was chaos, but fun!! What was moving to me was how each time one of the kids opened a gift, they had to go and share it with their Dorm Mom or one of their other Mama's or Papa's. I had a lump in my throat all morning. The girls all got boots, jewelry and Barbie's…oh and legos also. The boys got action figure dolls, cars, race tracks, Tonka trucks and of course…legos. They also received a huge indoor basketball game, new clothes for church, and new tennis shoes. Oh, I can't forget to give a big shout out to four wonderful ladies who helped wrap all the gifts that went under to Christmas tree. They wrapped approximately 160 gifts in about 4 hours!! Thank you so much for your help my friends!! Blessings to all of you who helped to make Christmas special for these precious ones. This group heard about Sonshine Hacienda by word-of-mouth and contacted us through our web site. The contact family was Wade & Cheryl Ingram. Last summer, Bob and Debbie Lewis visited their Bible Study and answered their questions about a possible mission trip to San Felipe. This Bible Study group has been in existence for thirteen years. They represent 3 different local congregations. For the last thirteen years they have taken a missions trip. This year they came to work at Sonshine Hacienda. The men built a much needed tool shed (sorry guys, I somehow lost the photos I took of you working on the building) and the women and youth worked with the Sonshine kids. This mission team made a huge hit with the children with their "Jump House" that they brought with them for the week. I thought the kids would wear themselves out jumping all day long. A big thank you to this group! They are already planning a return trip. Papa Gary said, "This was a fabulous group to work with. They can come back anytime." It is hard to get a picture to capture the CHAOS that was going on while the gifts were being opened. But the kids were all patient and so HAPPY. 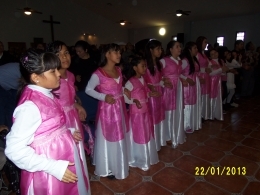 Three of our girls were part of a dance group...dancing for the Lord at Christmas. They worked so hard to learn the routine with the tambourines and all the movements. It was beautiful! Alexa,12 yrs. & Perla, 10 yrs. are part of their school Color Guard. Alexa is the Sargent in charge and Perla is holding the small end of the flag. This picture was taken at a local parade celebrating Mexican independence. Oh, they are sisters.